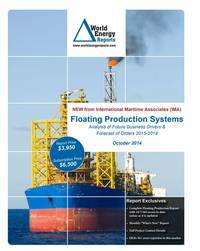 The April WER report provides details for 239 floater projects in the planning stage, 69 production or storage floaters now on order, 265 oil/gas floating production units and 15 floating regas units currently in service and 25 production floaters available for redeployment contracts. New to this monthly report is a detailed map summarizing where floating production and storage systems are now being built. The report also includes an update of the Petrobras situation (which could be easing) -- plus information on the Shell acquisition of BG, the creditor seizure of OSX 3 and the bumpy start-up of the new FSRU terminal in Pakistan. Information is current as of 17 April.